The Nakhon Thong community is situated just north of Sukhumvit Road and across the canal from the large municipal market and bustling town center of Samrong in Samut Prakan province. My sister moved to this community about a year and a half ago along with my elderly mother whom she has been taking care of the past five years. It’s a convenient neighborhood with all essential services within a short walking distance, including two large, open-air fresh markets, a shopping mall with a big department store and modern supermarket, branches of all major banks, and the post office. Although it is in Samut Prakan province, the town of Samrong is only a few kilometers across the boundary line from Bangkok and is very much part of the greater Bangkok metropolitan area. Mass transportation systems and freeways make commute to jobs in the heart of the capital easy. 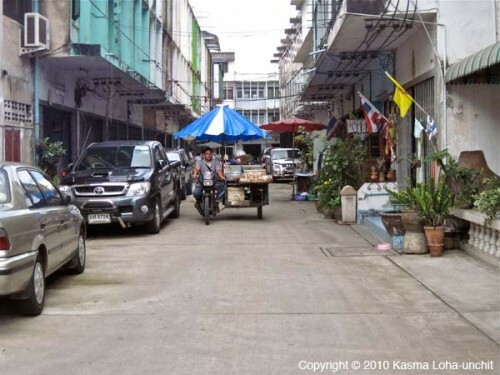 In many ways, Nakhon Thong is a typical Thai working class community with most of the residents living in two- to three-story townhouses or rowhouses along quiet dead-end streets and alleys. Many of the rowhouses have been converted into primary residences from machine shops prevalent in the area in years past. Most are homes to families with two to three generations living under the same roof, so it is common to see grandmas and grandpas visiting one another and small children running around the alleyways playing. 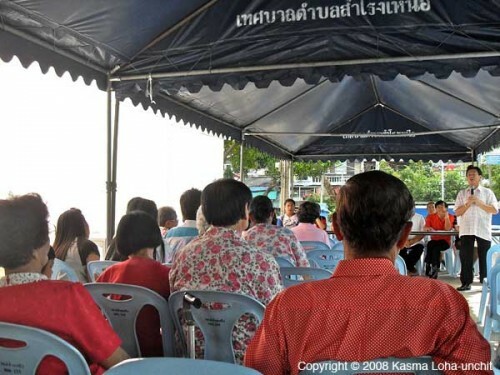 Like in many communities, there are social programs for the residents sponsored by the district government. 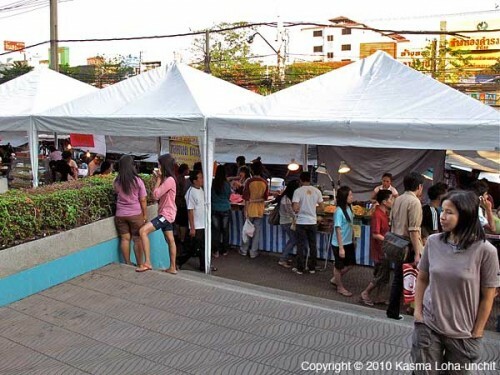 For instance, for several weekends last year, free cooking and craft classes were offered in the open area by the canal that serves as the community’s forum. Every weekday evening, a free aerobic exercise class is given in this same space. Neighborhood meetings are frequently held here as well with good attendance and most of the residents know one another and watch out for each other. Living in the community is a district representative who visits every home to make sure underweight children are provided with free milk and the elderly and the handicapped are given assistance in applying for the central government’s 500 baht per month welfare program for the disadvantaged. As in many working class communities, there are cottage businesses operating on the ground floors of many of the rowhouses. 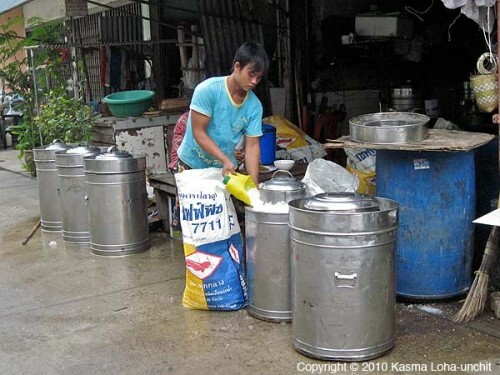 Among them is a home that makes coconut ice cream in large canisters for tricycle street vendors. Another home sews striped fiberglass bags like the ones you see selling in most marketplaces around the country. Still another home makes beautiful cloth cosmetic bags for vendor stalls by the shopping mall. But perhaps the most common cottage business is food and there are many cooks along the alleyways of the community offering a range of either pre-made or cook-to-order food. 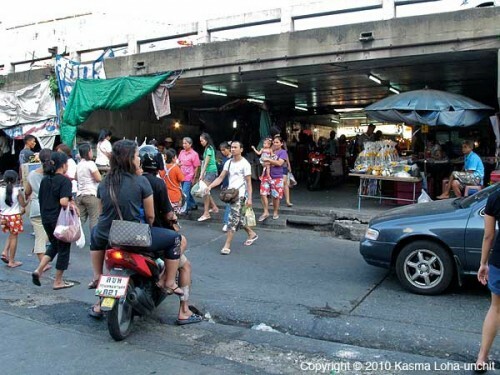 Together with all manner of tricycle, motorcycle and pushcart food vendors who regularly come into the neighborhood, busy home-makers and the elderly need not leave their homes to be well-fed. 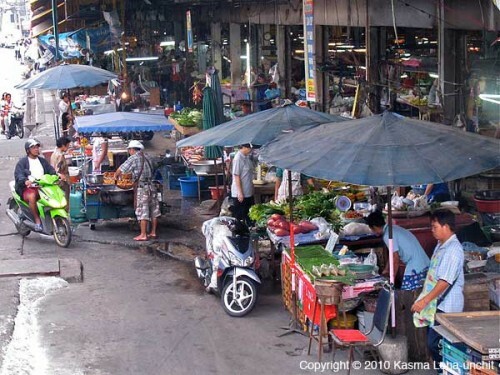 For more choices, a short walk over a pedestrian bridge by the Sukhumvit Road overpass, or an even quicker and easier 2-baht ferry boat ride across the canal will bring you to a bustling marketplace selling all kinds of fresh produce and meats, as well as a wide assortment of ready-to-eat foods. From there, a short walk across the street takes you to another large open-air food market by the big shopping mall, in which are plenty of eateries on several floors. Busy commuters tired out by Bangkok’s notorious traffic have plenty of choices to pick from on their walk home from the bus stop and need not worry about cooking after a long hard day. Click on “Play” below to begin a slideshow. You can also click on any picture individually and either scroll through the images using “Next” and “Prev” or start the slideshow at any image. Captions accompany the images. Clicking on a slide will also take you to the next image. A community meeting sponsored by the district government announces social programs planned for the neighborhood. 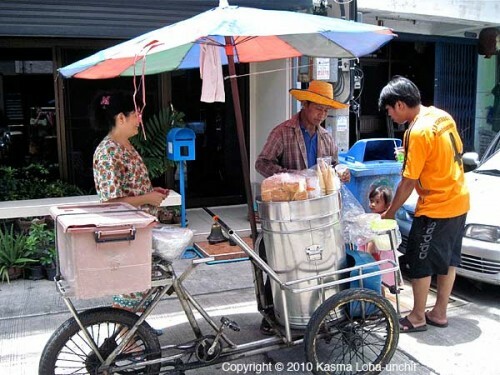 My sister waits for her turn to buy coconut ice cream from a tricycle cart parked in front of her townhouse. The vendor makes a Thai-style ice cream sandwich for my sister. 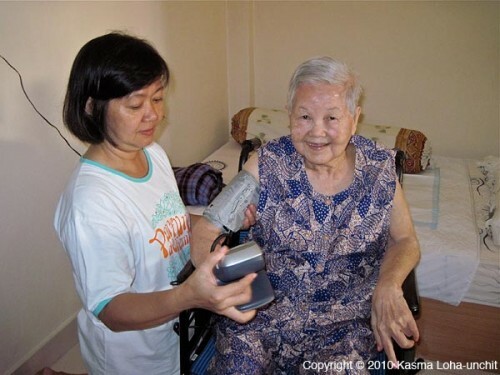 Wan, a neighbor hired by my sister to help take care of my mother, takes her blood pressure. Wan is also very active in helping handicapped people in the community. 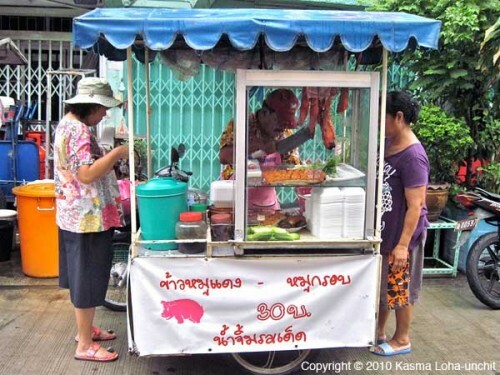 A pushcart fried chicken vendor visits the neighborhood. 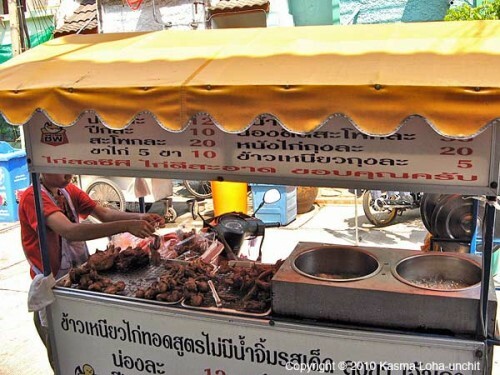 This motorcycle vendor is well-known in the neighborhood for his delicious barbecued pork and crispy pork rice. This is the community's spirit house. 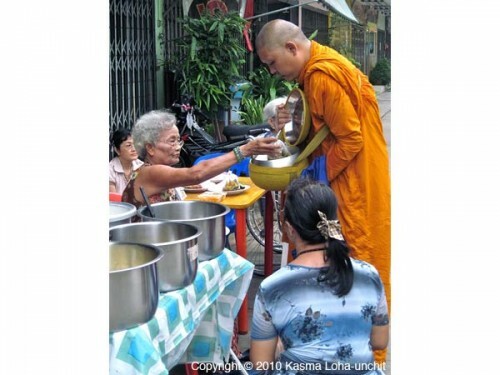 Nan, an elderly neighbor, gives alms to a monk across the alley from the community's spirit house. 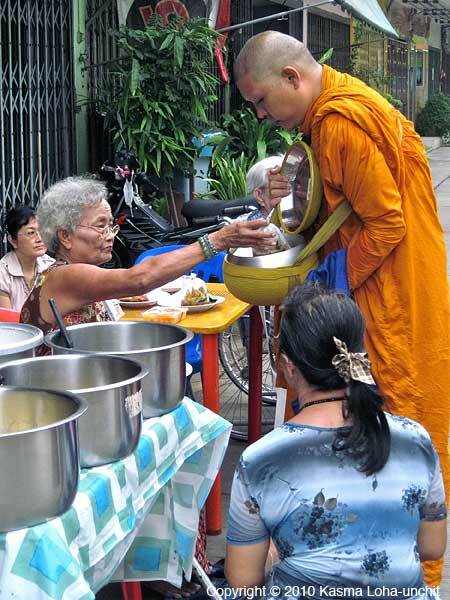 The woman kneeling in front makes a variety of food (in the large pots) each morning for sale outside her home as alms offering. 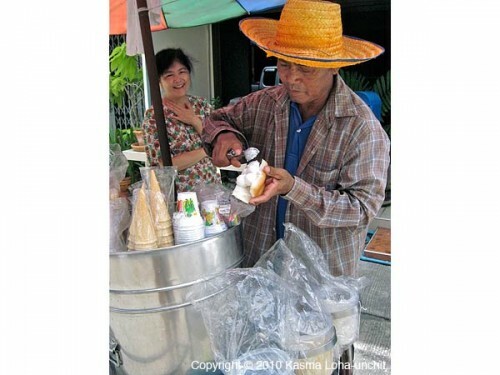 A couple of doors down from where residents gather in the morning to give alms to monks, coconut ice cream is being made in large canisters for tricycle cart vendors who will come by to pick them up. A motorcycle food vendor makes his way into the community, announcing his arrival with the sound of a peculiar horn. 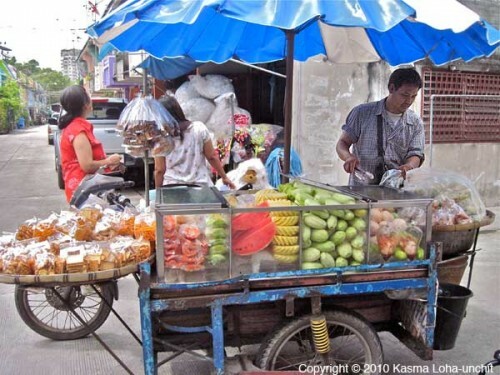 A motorcycle cart sells fresh and pickled fruits and snack foods. 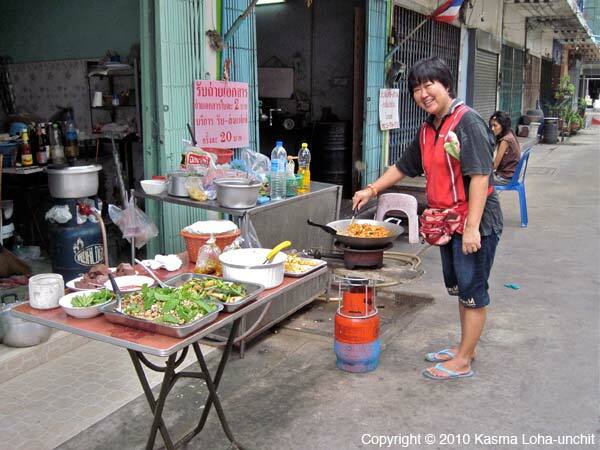 Neighbor Keow, who loves to cook, makes delicious dishes on propane burners outside her home to sell to residents in the community who doesn't have time to cook. She also makes some money on the side by selling transportation services with her pickup truck. We've relied on the convenience of hiring her to take us to the airport on our trip back to the USA, especially with our big pieces of luggage which wouldn't fit in a single cab! 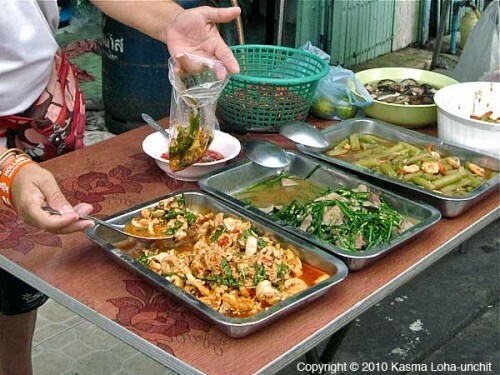 Appetizing home-made food to go varies from day to day from neighborhood street stalls, giving busy residents choices and variety in their diet. Jeng, who lives across the alley from Keow, is slicing up yummy crispy fried pork belly for me to take on my plane ride home. She cooks just about any standard wok dishes to order. Dtia and Jae make pork soup noodles from a push cart parked outside their home. 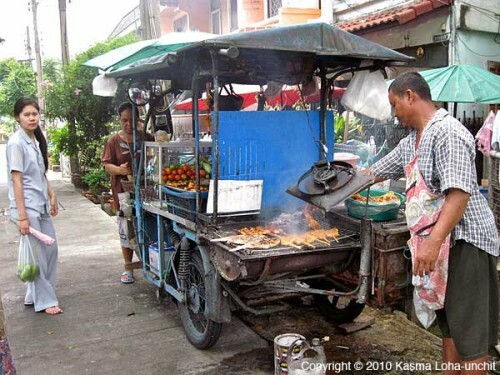 A couple make green papaya salad and grill chicken and fish on a pushcart outside their waterfront townhouse. 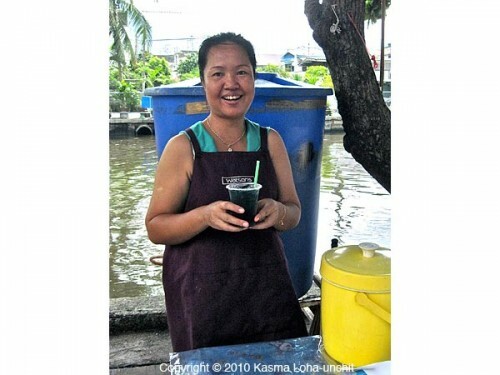 Hohm is proud of her made-to-order Isan-style hot-and-sour salads, which sell out every day. Across the walkway from Hohm's cart, Oy sells a home-made herbal drink of pandan leaves and butterfly pea flower, which she grows herself. 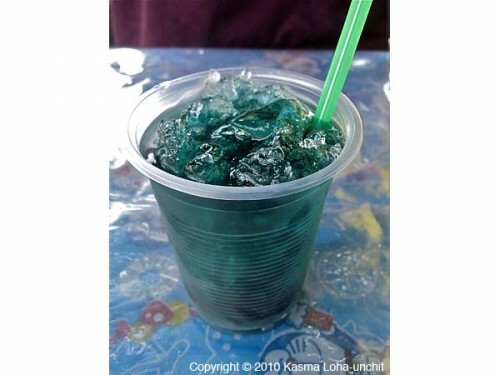 Oy's herbal drink is colored naturally with fresh green pandan bai toey leaves and the deep blue butterfly pea flower (dawk anchan). 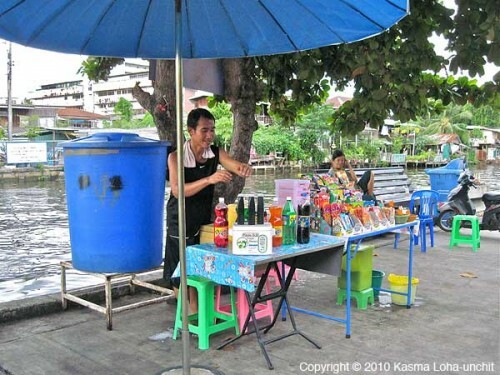 Oy's brother sets up the tables along the canal, selling various cold drinks and snacks on a hot summer afternoon. 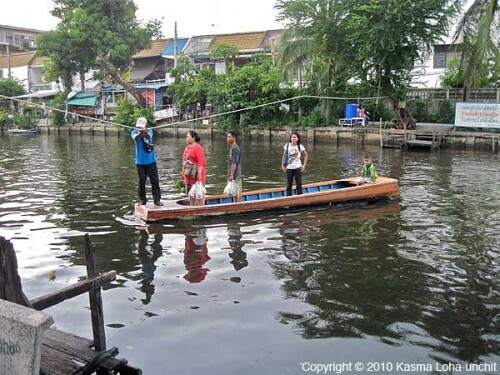 Petch and other members of his family operate a simple wooden boat "ferry" service to cross the canal to the marketplace for two baht per ride. 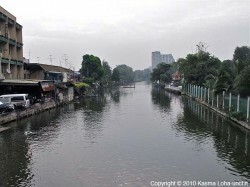 This view of the Klong Samrong is seen from the middle of the pedestrian bridge crossing the canal. The community is situated on the right bank where the ferry boat is seen at a distance in the middle of the picture. 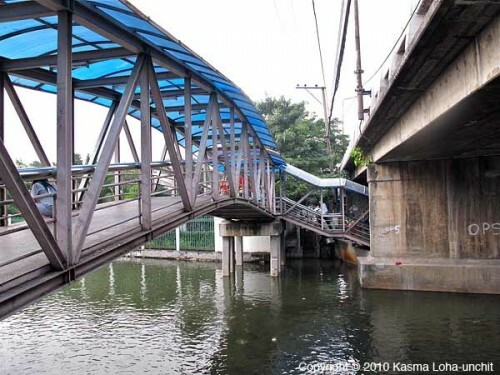 The pedestrian bridge straddles the concrete Sukhumvit Road bridge. This picture is taken from the marketplace side. 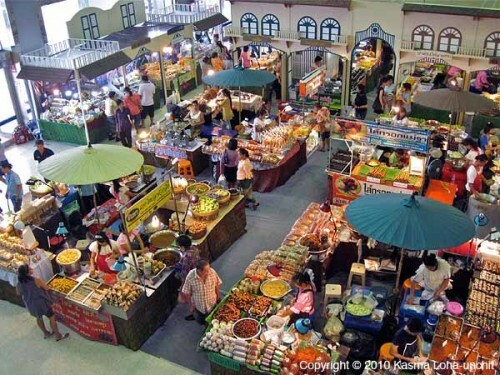 The huge Samrong municipal fresh food market as seen from the bottom of the pedestrian bridge. 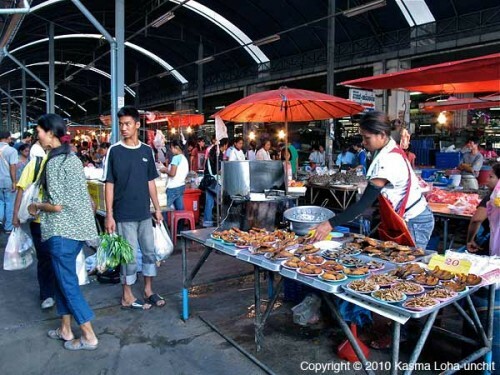 In another large open-air market across the Sukhumvit Road overpass from the municipal market is bustling with shoppers. Weeklong food fairs are frequently held in the wide open area on the ground floor just inside the main entrance of the Imperial World shopping complex. This is another reason why residents in nearby communities hardly need to cook. Outside the Imperial World shopping complex are more food stalls under tents along the sidewalk. Written by Kasma Loha-unchit, June 2011. 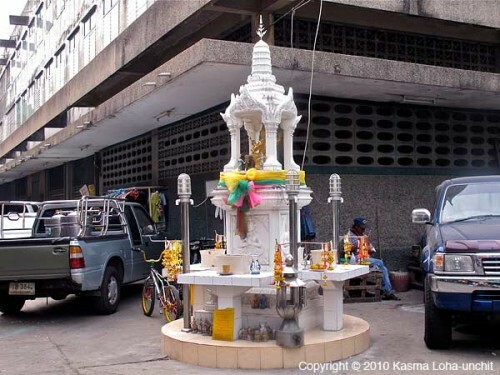 This entry was posted on Friday, June 3rd, 2011 at 12:05 am	and is filed under Markets, Thai Culture. You can follow any responses to this entry through the RSS 2.0 feed. You can leave a response, or trackback from your own site.